I do learn new things. I just forget them. Unless I write them down. Because of this, I also relearn things. So, for March I attempted to keep notes of things I learned. I missed a few. Like the new tidbits I learned in a conversation with my cousins a few weeks ago. I just knew I’d remember. Two hours later. Nada. Still haven’t remembered. But, I did manage to keep track of a few things. If I can find my list. 1. Thanks to my sister, I learned a new word APRICITY. Now that Spring is here, maybe we can enjoy some Apricity. 2. I learned that the mountain logo on a Toberlone candy bar has the shadow of a bear climbing the mountain. You can look for it here. Also, the Tostitos logo has two guys reaching for the same chip to dip in the bowl of salsa (the dot on the “i” is the bowl of salsa). For other hidden meanings in logos’ click here. 3. I learned that I can get a free paint sample from Lowe’s Spring Color Palette and a free fan deck. I was browsing through my mom’s April House Beautiful and found one of those annoying, stiff, index card sized ads they always stick in between the pages and it was for a free paint sample. I am excited because I love a good paint sample. You should see the back of my front door which currently has shades of blue and gray because I thought I might want to paint it. I started this journey, maybe three years ago. I have decided that it will be painted in April. Thanks to Lowe’s. I took the What’s your color personality quiz. My results? The Darling Dusk Collection. I’m really feeling Sprinkle. Maybe that means the door should be a shade of blue? 4. Also, did you know that Target has Devine color paint and wallpaper. Peel and stick wall covering that is repositionable. I may need to find a Target soon. 5. Dr. Oz. What can I say. He is always teaching us something new, or re-teaching us something old that is new again. The whole debate over antibacterial soap. I had heard this one before, but he says we shouldn’t use it and explains why. Also, and this was new to me, Caramel coloring in your soft drinks and other foods allegedly causes cancer. You can read all about both of these issues here. 6. I watched a documentary called The Perfect Human Diet. Seems we should eat the way our early, and I mean early ancestors ate. A lot of what they said about our diet made sense. But then I wondered….if the ancestors they are talking about, don’t line up with what I believe…and if a lot of what they were saying seems to contradict what the Bible teaches me about food, then really, can I trust anything they tell me. I also have a book by Caldwell B. Esselstyn, Jr., M.D. that tells me to eat pretty much opposite of The Perfect Human Diet. He allows no fat. My doctor a few years ago wanted me to try his diet. I did for five weeks. I felt great, had energy, lost thirteen pounds, never felt hungry. We checked my bloodwork and my good cholesterol had dropped even lower and my Tryglycerides had shot up. Not good. I am not advocating either of these diets, neither am I saying that they aren’t the diet you should be on. Only you and your doctor can determine your dietary needs. But, the real take away for me is that no one has all the answers, because there are too many voices telling us too many different things about what we should eat and what is good for us and what is not. And, it changes often. What I have learned is that I need to make the best choices I can based on what is available and use common sense. And, eat real food, but less of it, if I want to lose weight. 7. According to a post that a friend put on FB, GMO foods are Okay for me to eat. The article did make it sound perfectly reasonable to eat genetically modified organisms. Still. There are also a lot of compelling articles against them as well. I guess I need to do more research on this one. And, the Cheerios that say they are GMO free? Don’t buy the marketing. All cheerios are GMO free because Oats have not yet, been genetically modified. So says the article and a couple of others I scanned. I also heard that Dr. Oz said GMO’s were ok to eat. Hmmmm. So, I guess that clinches it. See what I learned in #6 above. 8. I learned that I didn’t know I need a Tignanello purse. I had never heard of this brand until I saw some for sale on eBay. They say they are affordable. I guess it depends on how you define affordable. On Amazon they ranged from 49.70 to 189.00. I found a cute little black one, gently used, on eBay for 17.99 including shipping. I purchased it. To replace my little black Jacklyn Smith purse I bought ages ago for less than 20.00 and which is showing too much wear to carry these days. It was my favorite purse ever. I hope this one doesn’t disappoint. 9. I am learning, even now, as I write these words, that March does not always go out like a lamb. The wind is fierce outside my window pane. 10. And I , dear friend have stayed up way too late sharing what I learned with you. I am linking up with Emily over at Chatting At The Sky. Click on over to see what others have learned in March. Pingback: What I Discovered In August | StoneLeaf & Co. I know! I was so excited – if you read my sister’s comment below you will note that she knew and didn’t tell me 🙂 Thanks for stopping by! I learned a couple of things from you today. 🙂 If I had known you didn’t know about the HB paint sample cards, I wouldn’t have hoarded them every time I looked at mom’s magazines! You would have actually chosen a sample and swiped it on a wall or door. I just saved them for a rainy day, then lost them. Speaking of painting doors… I have the paint for my front door. Instead of putting a color swatch here, I’ll just let you wait until I get my door painted. So, April is our door painting month? Okay. I’ll do it too. They say confession is good for the soul! 🙂 Oh and they have expiration dates and say one per customer, so…. 🙂 Can’t wait to see your front door. And let’s don’t let this be like painting the canvas was a few years back, let’s actually do it in April. 🙂 You will love your bottle tree! 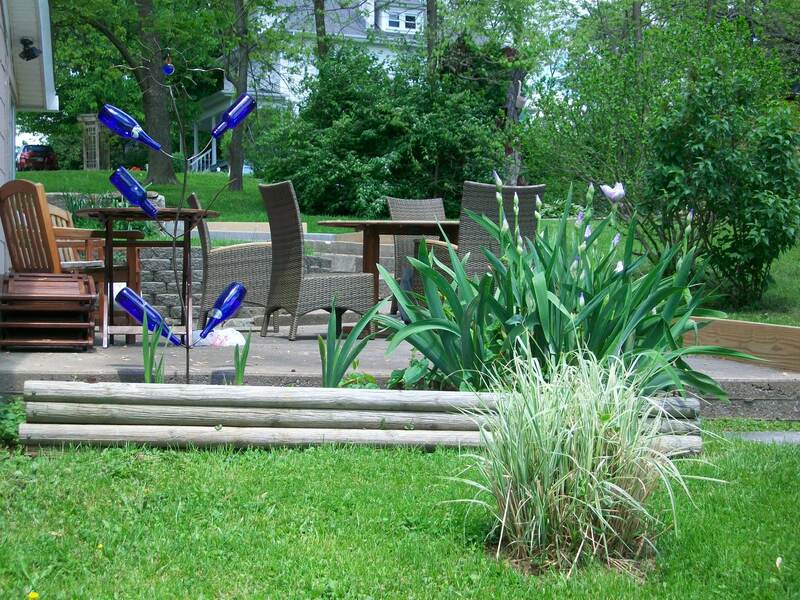 I have always wanted a bottle tree! Thanks! Hope your weekend is refreshing. #3 – I was just going through my copy of House Beautiful yesterday, and I didn’t notice the paint sample card – I have to go back and check! #5 – my husband has been telling me not to use antibacterial soaps, but I’ve been ignoring him. Now I might have to admit that he was right for once!! I love a painted front door – makes me want to see what is inside : ) I think you will have me checking out logo’s now and using a new word! Happy weekend. Glad you stopped by! I’ll do a post when I get my door painted. The outside is done, this is the inside – I want something besides white, just for a pop of color and a little quirk. So glad you stopped by – I enjoyed stopping by your place as well!